Home » VMware » vRealize Automation 7.4 has landed! 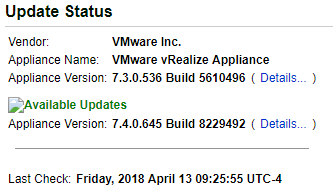 Today vRealize Automation 7.4 became available. As usual there are plenty of bug fixes listed in the release notes but there are really two cool additional features that I am anxious to play with. You can access the product through your My VMware portal. Right now, you can include custom properties on blueprints and show them on the request, but you cannot really modify the request form very much without getting very custom into things (which in turn is not very universal). Now, the vRealize Automation team has provided the ability to customize the request form. One thing I’ve been wanting is the ability to just add simple text to the form and this has been added! You can now provide a brief instruction or example in the request form so that people can better understand what they should put. For instance, if your business has a hostname/VM name standard, you could suggest (or even validate/constrain) a machine name as an example for the user to input as a guideline. Very cool. Deploying from OVF offers more flexibility. Or, maybe it provides less since that’s the idea of an OVF/OVA. Either way, being able to roll out pre-built OVF/OVA templates is great especially if the OVF is hosted/maintained on a vendor website or similar. No need to deploy the OVF to a VM, make a template, hook that into vRA, etc. Just configure the OVF for deployment right out of the box!